Pender’s Model Could Transform Your Chronic Care Clinic – Honest! It might be nutty, but I’m really getting into these nursing theorists and how to use their work in the correctional nursing specialty. I recently wrote about Orem’s Self-Care Theory with Nursing Sick Call and Peplau’s Interpersonal Relations with Intake Screening. So, why not try Pender’s Health Promotion Model in a Chronic Care Clinic? Are you with me on this? Let’s go! Nola Pender developed the Health Promotion Model (HPM) in the early 1980’s as a framework to describe how nurses can motivate patients toward desired healthful outcomes. The model is based on nursing, human development, and social cognitive theory. Pender sees a nurse’s role as collaborating with the patient to create the most favorable conditions for optimal health and well-being. This is particularly well-positioned for chronic disease management where nurses must motivate patients to make long-term lifestyle changes to improve health. A major underpinning of the HPM is the assumption that individuals value growth and seek improvement in their health status. Self-efficacy, a belief in the ability to succeed, is an important part of the model. The nurse, as well as the patient, needs to believe that positive change is possible. Here is where correctional nurses may need some self-reflection. The inmate patient population can seem mired in a sea of poor life choices that they cannot (or will not) overcome. Bringing a negative attitude to the nurse-patient relationship can affect the patient’s willingness to try and the nurse’s desire to motivate the patient to make positive health decisions. Here are some other propositions that are foundational to this model. Patients commit to actions that they anticipate will provide benefits of high value. The more positive the emotions associated with a behavior, the more likely the behavior will take place. Family, peers, and health care providers are a source of influence in health decision-making. Of particular importance to correctional nursing may be the connection between past experience and present situation in motivating needed health behavior changes. 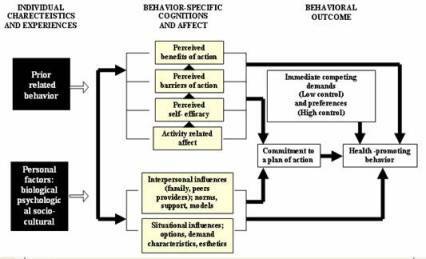 Prior related behavior and personal factors affect willingness to take health actions. For example, self-esteem and self-motivation are important factors, as are the patient’s perception of their health status. In addition, race, ethnicity, culture, education, and socioeconomic status influence decisions to improve health. So, by assuming the patient is able to change and factoring in their past experiences and background, nurses can motivate patients to make the necessary, even difficult, changes to support a healthy outcome. Most definitely, this is a simplistic overview of Pender’s Model but it gives us the basic framework for application in the correctional setting. Here is a diagram of the key elements of the Health Promotion Model borrowed from NursingPlanet.com. Could the HPM be helpful in your Chronic Care Clinic (CCC)? Let’s give it a go. Here is a common situation. Inmate Nagy, age 45, was just diagnosed with Type II Diabetes and is in for his first CCC visit after hearing the news. He has no other chronic diseases and is a Desert Storm veteran with PTSD and brain injury symptoms. He is in a patient education session with the chronic care nurse after his appointment with the provider. What attempts have you made in the past to eat healthy foods? What did you learn from these attempts? What are the personal benefits of improving your eating habits? What problems (barriers) might you have trying to eat healthier foods? What healthy foods do you enjoy most? Social Norms – Do any of your family members or friends expect you to eat healthy foods? If so, who, and what do they do? Social Support – Who will encourage you to eat healthy meals? Role Models – Do any of your family members or friends eat healthy meals most of the time? If so, who? Where can you find healthy foods to eat that you enjoy? Are you ready to set goals and develop a plan to eat healthier meals? During this discussion Inmate Nagy identified that he had attempted to eat healthy several times in his early 20’s but was only successful with a lot of effort. He doesn’t like ‘rabbit food’ and prefers a high meat diet. He has noticed in the last few years that he does not feel well on a high starch diet and occasionally tries to avoid chips and ice cream. He does like fruit; especially oranges and grapes. The only vegetable he likes is corn. His younger sister is a ‘health food nut’ and has often tried to get him to eat better. Armed with this information the nurse asked Inmate Nagy to get in touch with his sister and share his news and ask her for some ideas for health eating. He was also asked to use a provided food list to make at least 3 healthy food substitutions when he is in the dining hall and commissary. An appointment was set for 2 weeks later to review his progress and set new goals. So, what do you think? Would Pender’s Health Promotion Model transform your Chronic Care Clinic? Share your thoughts in the comments section of this post. ← Peplau’s Theory of Interpersonal Relations – Could This Really Work in Correctional Nursing?